Although Poker games based around the ancient Egypt are very common, it seems players can’t get enough of them, so IGT have added yet another game to this packed genre, with Treasures of the Pyramids featuring pharaoh’s, winged gods, an ankh and the eye symbol that turns up on just about every game that follows this topic. But it’s all done with the style and quality that has kept IGT at the top of the casino games business for decades, and there’s enough here to ensure that it’s not just more of the same, with a double-height wild symbol and a free spins game where all wins are multiplied in value. The pokie itself looks a little unusual, with some bits looking highly realistic and others being little better than cartoonish in style, but it’s all about how it plays and what people can expect to win, and in this respect, Treasures of the Pyramids is a quality game that fans of the genre will surely flock to. There’s 5 bright blue reels filling this pokie, with each containing 4 symbols and 40 paylines running left to right across them. Behind them, we see a detailed panorama of pyramids, palm trees, stacks of treasures and a beautiful black panther that will turn up during the game. Landing 3 or more matching symbols across a line on adjacent reels will result in a winning combination, and like many games, it’s the playing card symbols that will make up the majority of these. It starts with the 10, J and Q, which are each valued at 5x, 15x or 75x the line bet when landing on 3, 4 or 5 reels, and the K and A will return 5x, 20x or 100x. More valuable symbols are all Egyptian-related, with a green necklace paying out 10x, 30x or 150x the amount bet per line, going up in value through a red necklace, gold tablet, Eye of Horus, and ankh until we get to the winged god Isis, who pays 30x, 75x or 500x when landing on 3, 4 or 5 reels. The pyramids work in a different way to other symbols, as they can be scattered around the reels in any positions and will pay multiples of the total bet, not just the per line equivalent. Just 2 examples of the pyramid will be worth 1x the triggering bet, and landing 3, 4 or 5 of them will see wins of 3x, 25x or 50 paid out. 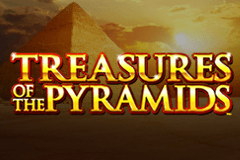 On top of these wins, 8, 15 or even 100 free spins are awarded with 3, 4 or 5 pyramids scattered around, and all wins during these, except ones created by the 5 of the wild symbol, are doubled in value. It’s possible to retrigger the round from within by having 3 or more scatters land at once, and any new games are added to the end of the current round. Although it’s unlikely, there’s the possibility of this round being triggered over and over, to a maximum of 600 free games. The reason that 5 of a kind wins with the wild panther symbol won’t be doubled is because it’s already a very valuable one, that’s worth 10x the line bet when landing on just reels 1 and 2, and 5000x when it stops right across a line on all 5 reels. This symbol acts as any other, with the exception of the pyramids, and when possible, will be able to fill in the gaps of matching symbols, or turn lines of 3 or 4 symbols into longer lines for higher prizes. Wild substitutions are accompanied by some nice animations of the panther taking a walk, that may not have much to do with the theme of Egypt, but looks very nice anyway. Players looking for yet another Egyptian-themed pokie will be more than happy to find Treasures of the Pyramids at their chosen online casinos, but not everyone appreciates seeing the same old symbols filling so many pokies. While there’s nothing really wrong with this game, it doesn’t offer up anything radical, particularly in the normal run of play, where playing card symbols that are just generic icons that don’t relate to ancient Egypt, will tend to dominate proceedings. Bonus features are adequate and the panther wild substitutions can boost the frequency with which players complete a winning line, while scatter payouts and free spins will certainly help to keep bankrolls topped up. In the unlikely event that players earn 600 free games, they are going to be handsomely rewarded with the treasures of Egypt, or a good few Dollars anyway.